Owing to the wide experience in this domain, we are instrumental in offering Liquid Nitrogen Withdrawal Device to our clients. We are one of the leading companies in manufacturing of withdrawal / transfer devises for withdrawal of liquid nitrogen from 26, 30, and 50 Litre cylinders. The low-pressure liquid transfer devices provide a means for dispensing, liquid nitrogen from a vacuum-insulated container. It affixes to the top of the dewar and features a faucet-like on/off control that makes the process simple. A rubber plug forms the pressure seal between the container neck tube and the device. The locks secure to the container handle prevents the device from being forced out of the neck-tube by the internal pressure. 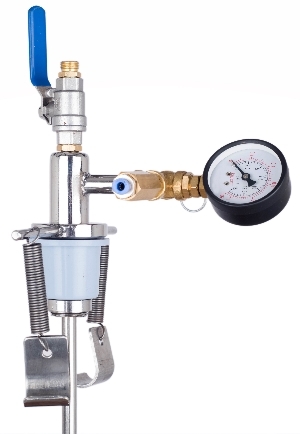 Pressuring valve is used to release the container pressure before removal of the transfer device. The liquid transfer valve is a ball-type valve which goes from fully-closed to fully open in one-quarter turn. It also includes a phase separator to clean the LN2 prior to withdrawal and also acts as anti splasher of liquid nitrogen. All Frostbite liquid nitrogen withdrawal equipment comes with a 12-month warranty.